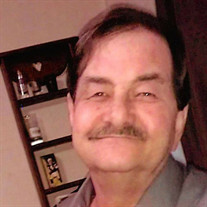 Doug Allen Riddle, 61, of Hannibal, MO passed away at 4:10 p.m. Thursday, April 19, 2018, at Hannibal Regional Hospital. Funeral services will be held 1:00 p.m. Wednesday, April 25, 2018, at the Smith Funeral Home & Chapel, in Hannibal. Rev. Jamey Michael Dyke will officiate. Burial will be in the Howe Cemetery in Timewell, IL. Visitation will be held 5:00 to 7:00 p.m. Tuesday, April 24, 2018, at the Smith Funeral Home & Chapel. Doug was born on February 5, 1957, in Anderson, IN the son of Vestel and Dorothy (Tanner) Riddle. He was united in marriage to Brenda Hogan on June 27, 2009, at a ceremony held in their best friend's back yard in Hannibal, MO. Survivors include his wife Brenda Riddle of the home; daughter, Tonya Kirkland and husband Justin of Hannibal, MO; son Matthew Gauch and wife Amber of Springfield, IL; granddaughter, Addison Kirkland; four fur babies, Socks, Sadie, Brandy, & Gabby; brother, Garry Riddle and wife Valerie of Hemet, CA; sister, Sharon Smith and husband Bruce of Las Vegas, NV. In addition to his parents, Doug was preceded in death by a grandson, Ian Douglas Kirkland and three fur babies, Shelby, Gretchen and Rusty. Doug worked as a machine operator and forklift operator at General Mills in Hannibal. Away from work, Doug was a Beatles fanatic, he enjoyed going to concerts and listening to the Beatles any chance he had. He also enjoyed taking trips on his Honda Shadow. When Doug wasn't able to listen to music or ride his motorcycles he could be found sitting in his recliner enjoying a movie and a Diet Coke or enjoying the companionship of his fur babies. Doug loved his family and friends and cherished the time they spent together and the memories that were made. Pallbearers will be Matthew Gauch, Justin Kirkland, Ernie Becker, John Richardson, Shawn Richardson and Marty Morgan. Honorary pallbearers will be Roy Livingood, Shane Livingood, Clyde Boernson, Tim Brokes. Memorial contributions may be made to the Smith Funeral Home & Chapel, to assist the family with headstone expenses.